I follow and if you read WtR? You follow the Russian gold reserves. I also follow the Chinese and their buying of gold also. I do not follow the USA gold reserves, because? Well there 99% likely is not any reserves to talk about. I do not even think that China and Russia report the amount they really have stored and buy each year. I think it is under reported by a whole bunch. It makes sense, what would you do with your antagonist paper/cloth based non backed dollars that are being shoved down your throat. Buy gold? Buy silver? Buy anything that has usage when no one else has it? 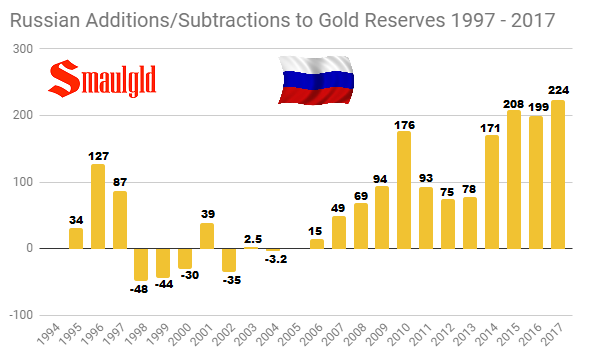 If Russia has 1838 tons of Gold, but has the GDP that is 1/8 of the US, then this is like the US having 8*1838, ie. 14,704 tons. Do you think that the US has 14,700 tons of AU?